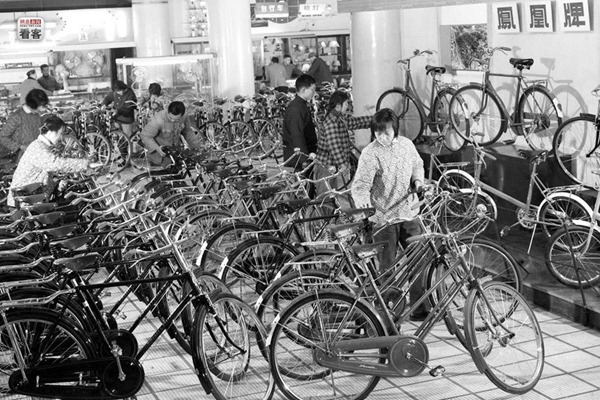 During the 1960’s and 1970’s, the bicycle was the most popular product in China. Bicycles were often given as wedding gifts, and in 1986, US President George HW Bush received two bicycles as a gift from Beijing. The country was known as “bicycle kingdom” and the vast majority of the population used bicycles to get around. People were able to get from A to B without being stuck in traffic. 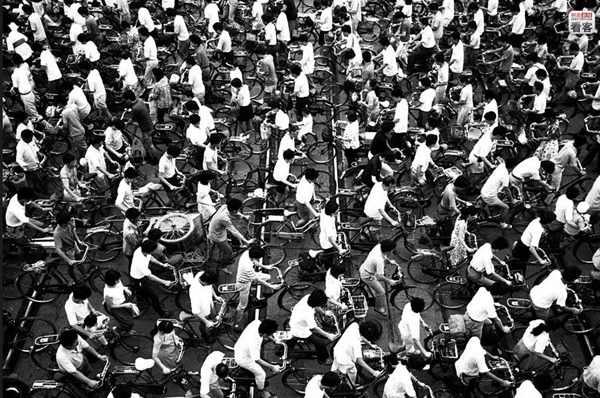 Traffic signals were unnecessary, and hordes of bicycles flowed like rivers through Chinese cities. 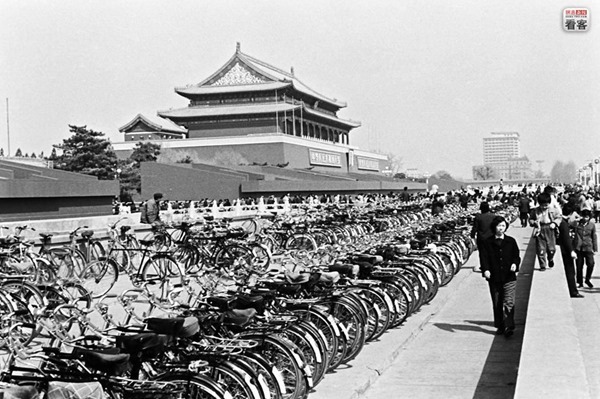 Below are a few photos courtesy of Beijing Shots that illustrate how prominent bicycles were in the urban landscape in China, allowing people to efficiently get around their cities. The following photo shows a bike shop in the 1970’s. Notice that the style of bicycles that are being sold in this store. They are bicycles built for everyday city riding in regular clothes, featuring chain guards, bells, fenders, and sit in the upright position. In this shot you can see how wide the bike lanes were in 1986 compared to the amount of space provided to motor vehicles. This bike lane appears to be at least 3 car lanes wide, or perhaps even 4, and this is just for bicycle traffic in a single direction. 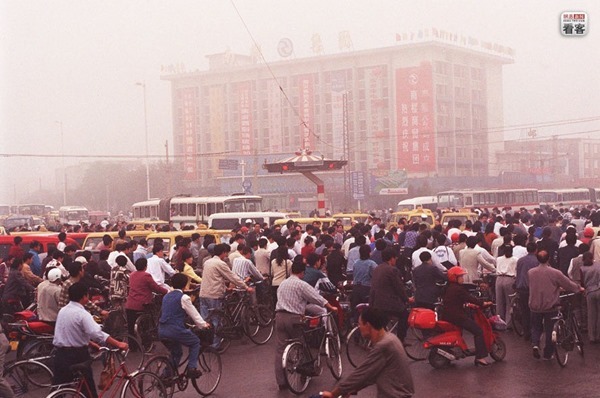 During the 1990’s, car culture began sweeping over China. In this 1998 photo you can see traffic signals and an increasing number of motor vehicles. But bicycles were still king in the “bicycle kingdom”. 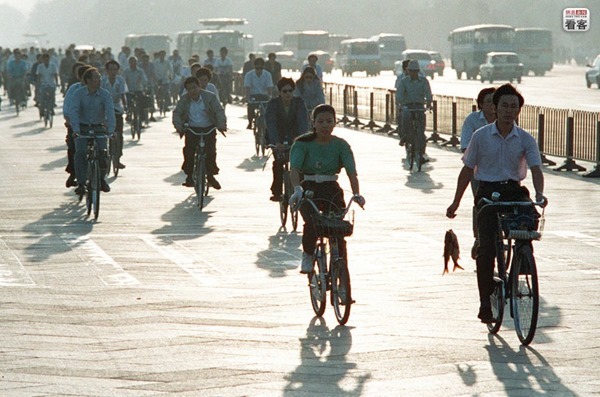 It wouldn’t be until the 2000’s that cars began to really overtake bicycles in China. Of course, nowadays, the most popular product in China is now the motor vehicle. The streets no longer flow like rivers, and pollution and congestion are now accepted as the norm. Massive restrictions are placed on car license plate registrations to contain the number of cars on the streets in Chinese cities, and bicycle lanes are being converted to make room for more cars. 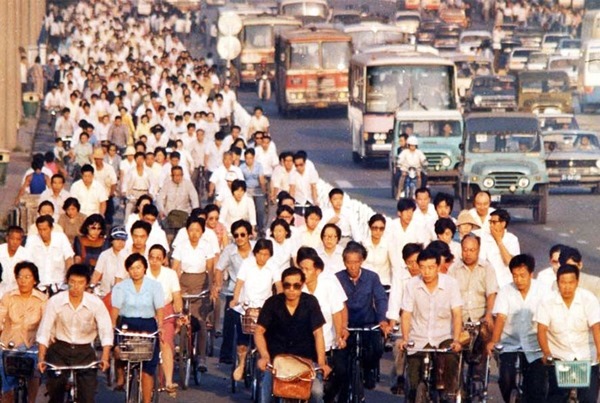 If only we could take a time machine back to the 1980’s and return Chinese cities to their former glory with vast freedom of mobility via the trusty bicycle. Love that photo of the bike shop, very modern and full of non-sporty bikes, kinda like our shop! Thanks for this, truly amazing to see all those bikes. Car lanes will never be able to move as many people per sec as bycicle lanes. It’s just math. Great pictures. Makes me a feel a bit sad that we in the west (with the exception of Holland) can not get our act together.